Contemporary cuisine with plenty of seafood and fresh Hawaiian ingredients. : Jojo Vasquez has returned to The Banyan Tree as chef de cuisine. Start with the Maui onion and white bean soup or perhaps Dungeness crab, heirloom tomatoes and Dijon vinaigrette. Entrées might range from beef tenderloin paired with maitake mushrooms to crispy Hawaiian snapper and rock shrimp. 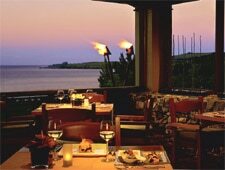 You won't see the banyan tree, which used to grow through the middle of the building, but on a clear day you can see the Kapalua coastline and Molokai from many of the tables and the open-air patio.